Rainbow has been performing for Children's parties and Company Picnics over the last 9 years and entertained thousands of children and adults. Many parents are so pleased with her that they have her back year after year, and all of them say that Rainbow made the party very special. Rainbow is famous for her face painting. Instead of just painting a heart or flower on the child's cheek, she transforms them into their favorite cartoon character. Some of the faces she does are; Batman, Ninja Turtles, Shera, Bunny face, Kitty face, Beauty (Beauty & The Beast), Spiderman, Captain Hook, Princes face and many more. Games are often the highlight of the party when Rainbow conducts them. She does the traditional hits like Potato sack races, musical chairs and pin the nose on the clown, as well as new ones like balloon stomp. Rainbow does comedy magic for kids, but adults usually find her show very entertaining also. 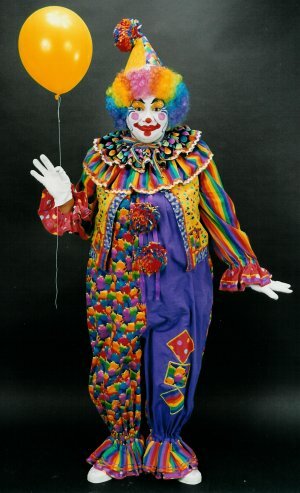 Rainbow the Clown will give you the best party and most fun for your entertainment dollar.